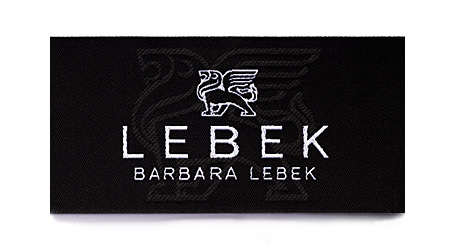 A special laser-based technique that we have developed, enables us to reach some stunning effects on woven labels of any kind. The possibilities are nearly infinite and for creative designers no limits are set. The results of the laser treatment are quite amazing: There are colour-in-colour effects that are similar to a watermark that changes its visibility according to the light incidence and even freely designable structures that seem to be engraved into the background (which they basically are) are easily makeable. Please note that this special laser technique is available for black or white backgrounds only. according to the light incidence. The so called "watermark effect" is the most chosen application of our laser-technique. A graphic element - mostly the logo - is laser-engraved into the background. Since the laser slightly burns the yarns, its surface becomes matter and reflects the light less than the others, yet it is pin sharp. According to the light incidence, a watermark effect is the outcome. The final result is a label with an extraordinarily noble look. However, the price for such a label is just a few pennies higher than for a normal one. In the file, the designer has just placed the logo in a contrastive colour (in this case in magenta) above the background for the laser to know where to act. The white elements where then simply placed in the foreground. In this example, a texture of thin horizontal lines was chosen. The laser-treated lines are more matt than the rest of the background and the reult is a very nice fine serrate structure that goes quite well with sportive men's suits. In the file, the lines were simply placed onto the background in a contrastive colour. The two words were just put in the foreground. tangible and changes according to the light incidence. Raw but exquisite garments are this designer's domain and that's why some kind of a brocade texture was created. 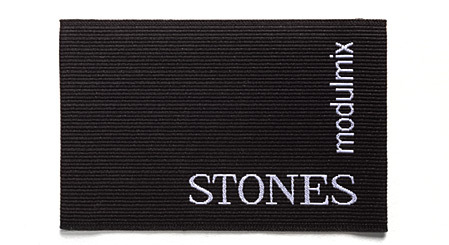 The outcome is quite unique: The laser-engraved elements create a rough character that is similar to wool, whereas in reality the label was woven in taffeta at double density in HD and offers a high level of details for displaying the brand name and the small letterings. The brocade elements were drawn in Illustrator and just put in a contrastive colour onto the fully black label background. The other elements in their two colours were just placed above it.